There are many folks in San Carlos who are considering moving up one level from their entrance level home of 800K-1.2M, to the 1.3M-1.7M price range. The problem is that the 1.3M-1.7M price zone is turning out to be a zone that some homes go into, but never come out. Of course, there are very good buys that do pop up in this range. Generally, buyers do recognize these homes and the sellers are spared from trying to navigate their way out of this very tricky price zone. (1) Flatlands or Hills. Most buyers either want the hills or the flatlands. In general the flatlands are more expensive. Expect to get more house for your money in the hills. In any event, by selecting one or the other you can start to thin out a very crowded price zone. (2) Attend Open Houses. There are some buyers who attend all open houses in San Carlos……which is probably not necessary for most buyers. However, if your target range is 1.4M to 1.6M….I would suggest widening the price criteria. Attend open houses for homes priced 1.3M to 1.7M. It is educational and will help you determine a good deal when it finally does come along. (3) Get Specific. Don’t compare the home against other homes in that particular area of San Carlos. Compare the prospective home against other homes on the particular street. Have homes on that specific street kept pace with the market over the years, or has it underperformed on resale? Your realtor should be able to supply the data necessary to make these comparisons. This price zone demands more time, patience and education….more than any other price zone in San Carlos. 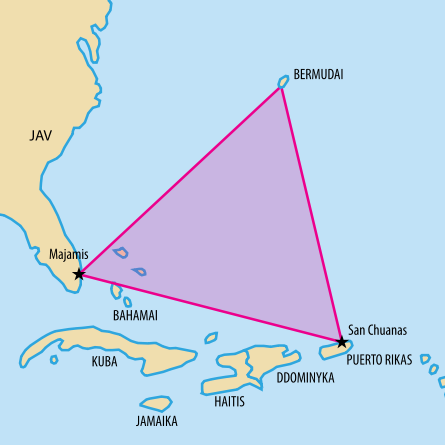 Where did you find a map of the Bermuda Triangle in Lithuanian?